If you like rockets and need some portable storage then this USB flash drive is just perfect for you. 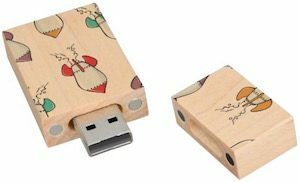 The flash drive is made from natural maple wood witch on it’s own makes a boring flash drive look great and on top of that light colored wood you find cartoon style rocket ships. The top of the flash drive that protect the connector keeps in place with little magnets so that it just looks like a solid piece of wood with rockets. You can get this amazing looking flash drive in USB 2.0 or USB 3.0 and it is available in 8, 16, 32 and 64 GB. Just get the flash drive you need and I think it is this Cartoon Rocket Ships Flash Drive.